I have to take a minute to tell you guys about a quick project I did this summer just a few days before some house guests arrived. 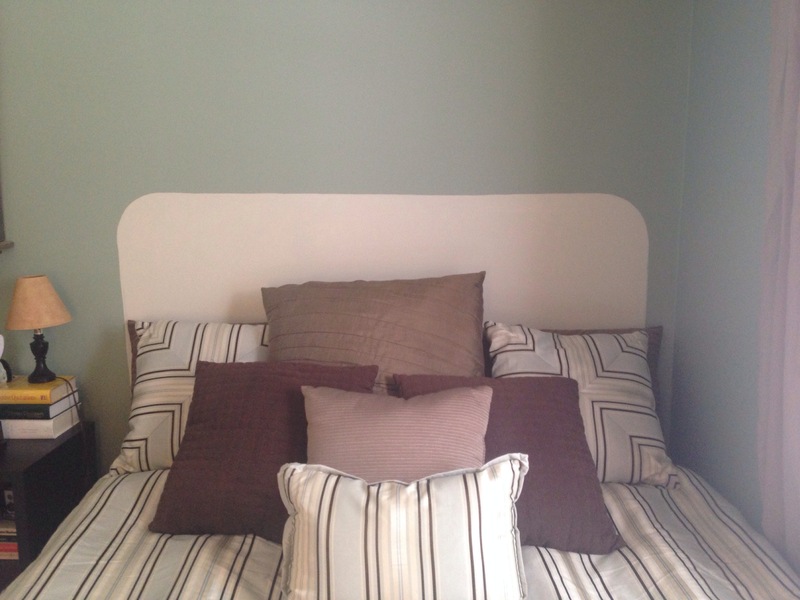 You may remember that our guest room has lacked an actual headboard since forever. 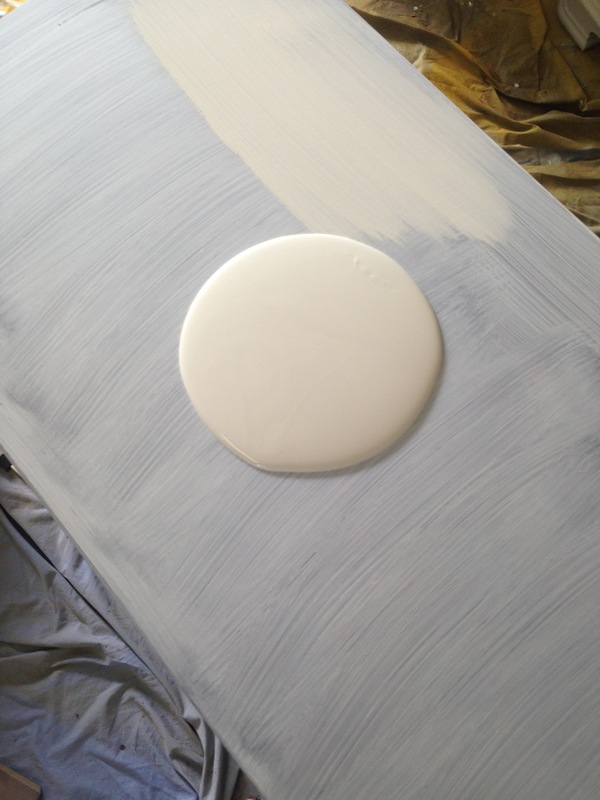 I even opted to paint one onto the wall when budget didn’t allow for a real headboard. One day I stumbled on a sale post in a local yard sale group on Facebook for a headboard. It actually happened to be for a bed frame (which I also needed since the guest bed was on milk crates at the time) and a hot pink headboard. Even more convenient: the post was by my cousin. She was sweet enough to give me a “family” deal and even delivered the bed frame and head board to me! 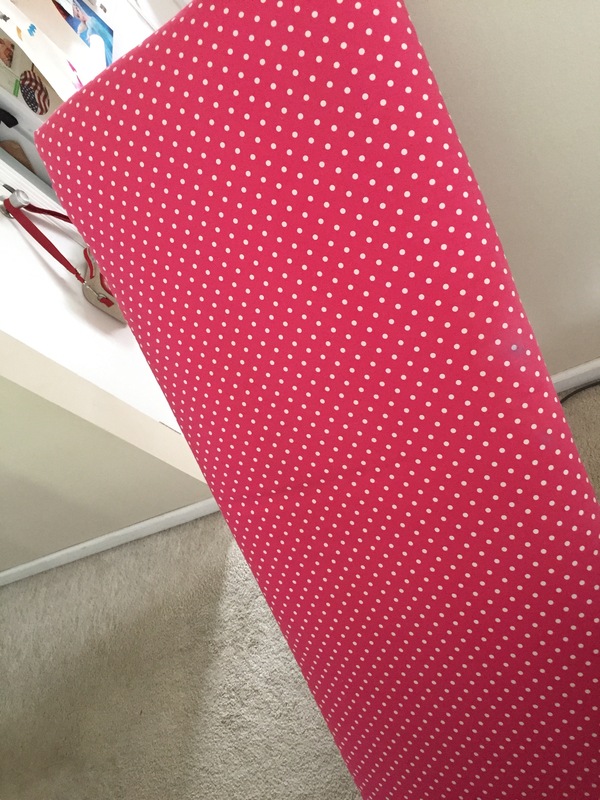 As adorable as the hot pink polka dots are… it wasn’t the vibe I was aiming for in the guest room. It sat in the guest room untouched for a while until I stumbled on some fabric I could use. 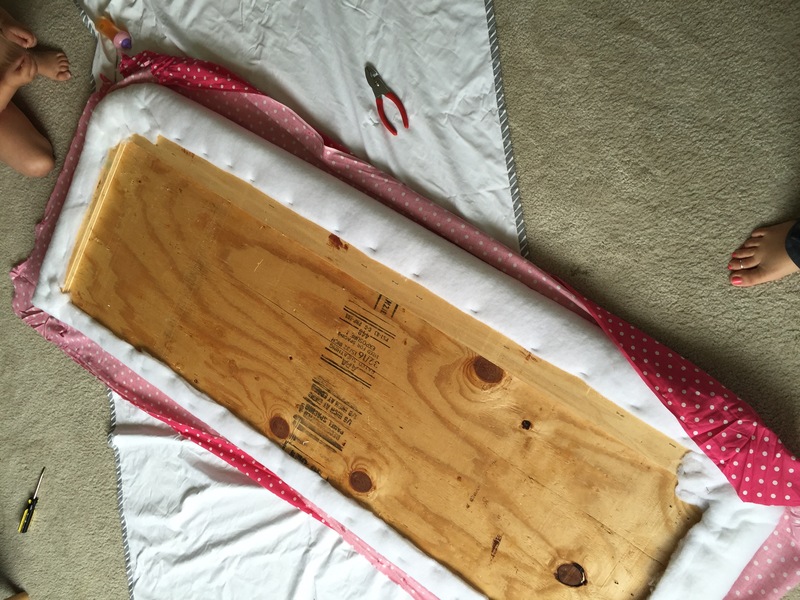 I employed my old trick of using curtains and shower curtains for upholstery projects. I’ve used them for headboards and ottomans in the past and they’ve held up well. They are a fraction of the price, are thick enough and durable enough for such projects, easy to clean AND I can often find them on sale at places like Target, Walmart, Home Goods and TJMaxx. 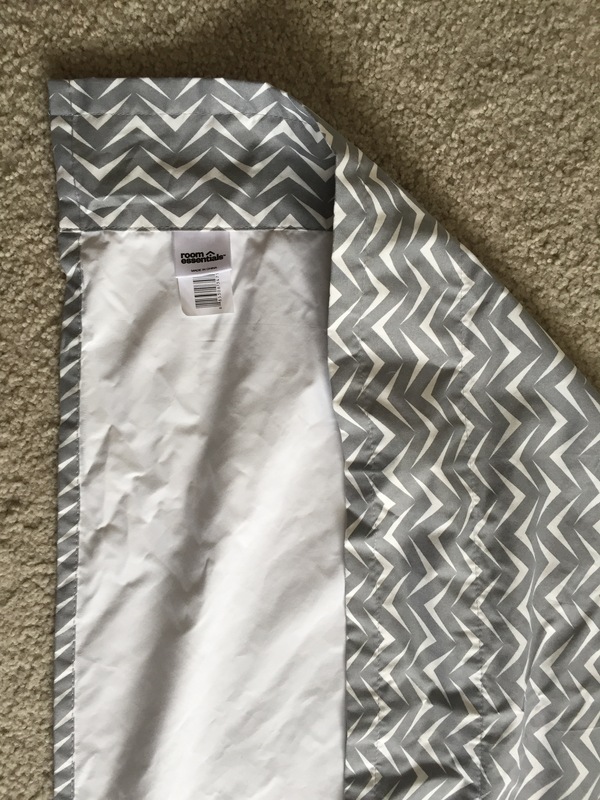 I found a single curtain panel on clearance (it was opened and returned) at Target for $9 and it was perfect for the gray and white I have going in the guest room. 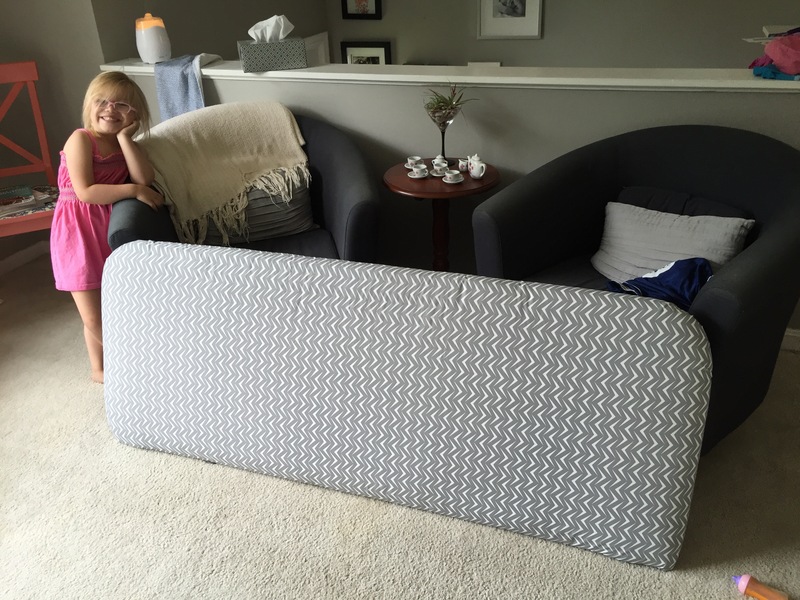 So one afternoon my trusty 4 year old helped me pry the old staples and fabric from the headboard to reveal the white backing. Then we laid out the curtain panel and got the work stapling. The curtain was just the right size and was easy to staple through. The rounded corners were new for me but I just folded a few little pleats as I went and it turned out fine. Ta-da! 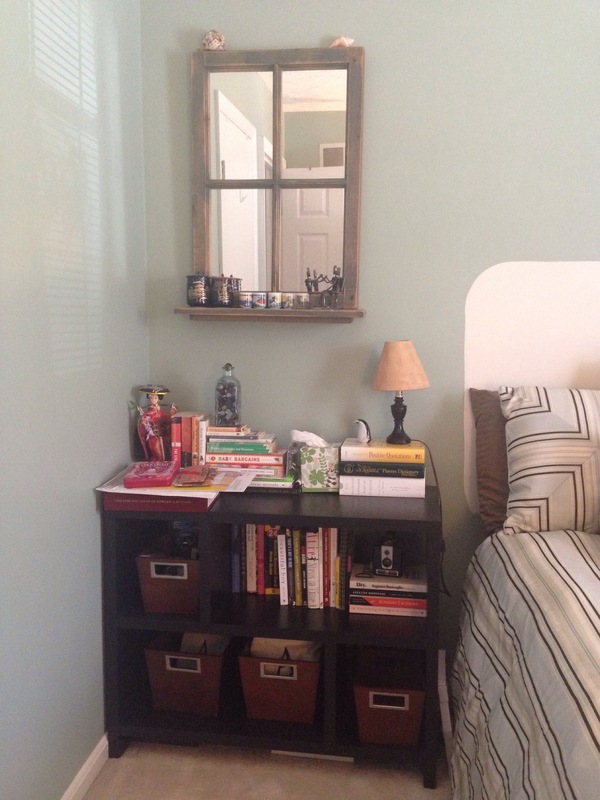 Then we added the legs and gave it a new home in our guest room. Pix to come (our house is currently prepping for construction … and the is a completely different beast that will require a series of posts. oy). 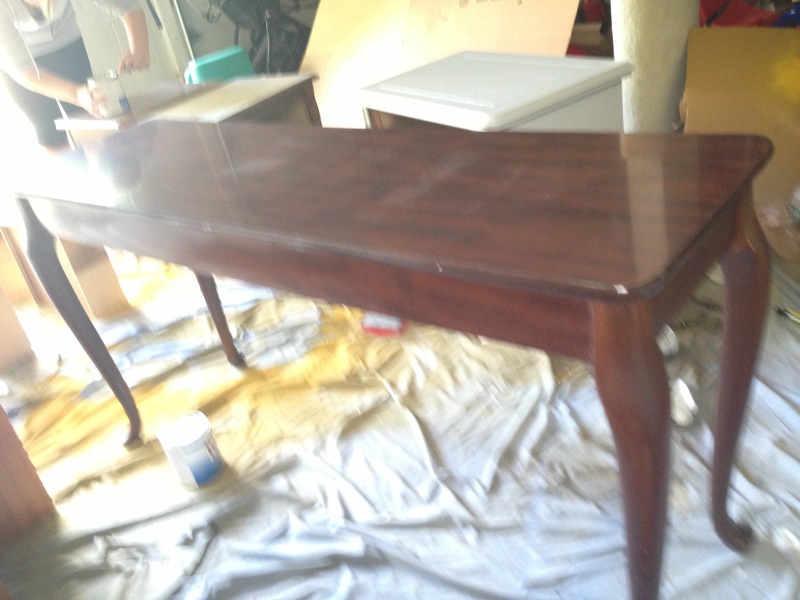 In the fall I found this sofa table in a good old fashioned curbside rescue. I had been driving around to keep O cool and happy during a long, hot soccer tournament. She eventually fell asleep. Of course that’s right when I discovered the sofa table waiting for me on the curb. Picture me trying to smuggle the table into my car without waking her. I moved two car seats and had to fold down one and a half rows in the Pilot all without waking O. Now picture me hoisting this beast into the back of the car all by my lonesome… Again, without waking the baby. The funny part is that I went through all this with absolutely no idea where I was going to use the table. In general the style is a little too formal and traditional to mesh with most of our decor. And the dark finish had seen better days and the rolling feet and bowed legs were less than modern. But there was something about it… Perhaps the fact that it had no price tag? I had to have it. It sat in the garage for months (obviously- it’s July). I don’t think I ever got a decent before picture until I started sanding it. I often walked by it thinking about the possibilities, or lack of, that it had in our home. A couple of times I even considered curbing it myself. Hubby liked that idea best of course. 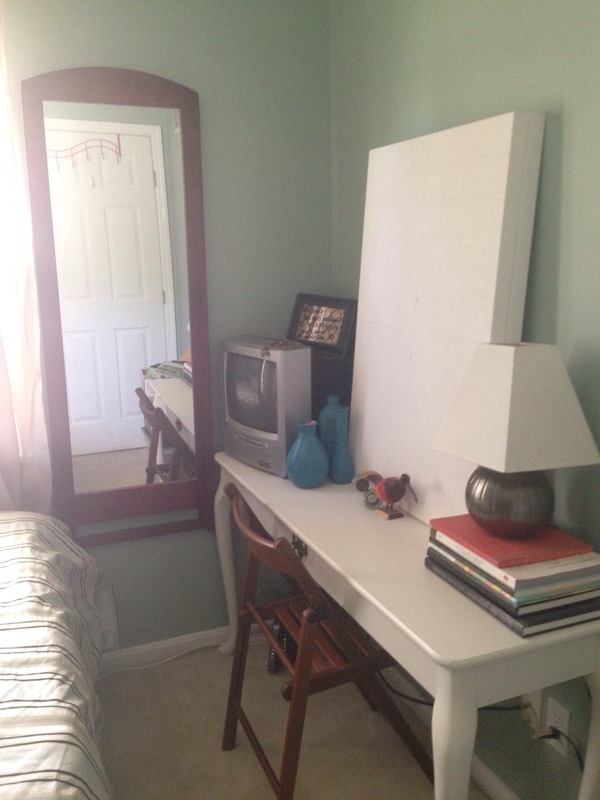 But recently I have been trying to bring more order to the guest room (more on that later), so I suddenly imagined it serving as a desk/vanity/tv stand. Does that even make sense? Maybe not just yet but hang with me. The room is snug… And that is a generous description. 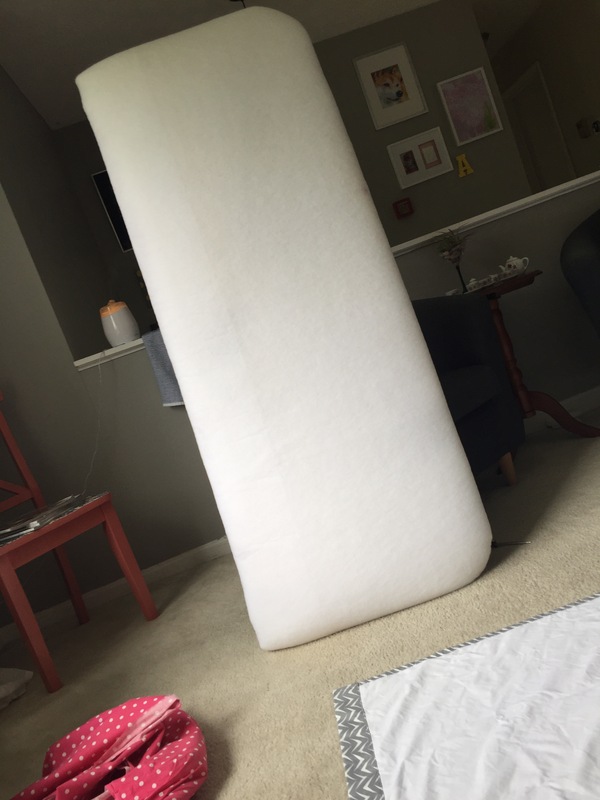 I’d guesstimate it to be 8’x10′. So every single piece in there needs to serve a good purpose, hopefully multiple purposes. 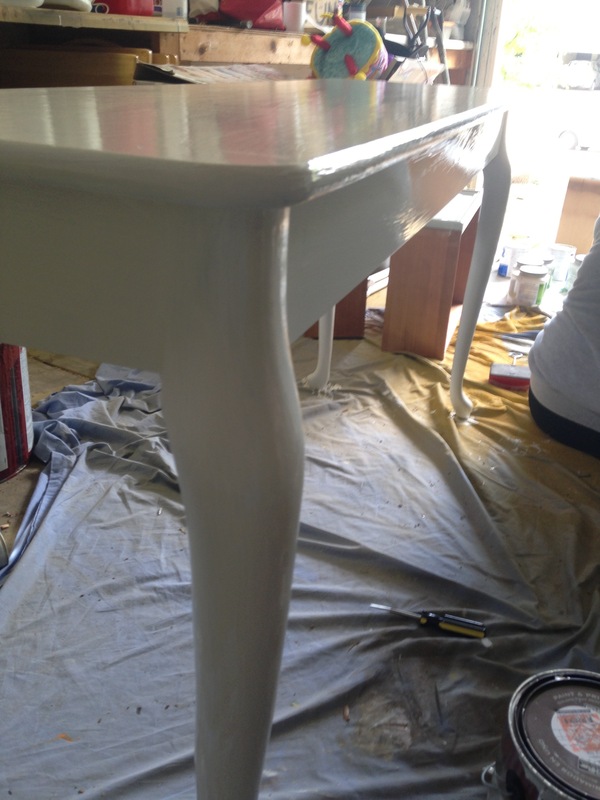 Without a full plan I decided to start painting the sofa table because it would need some love no matter where it was going to end up. And I just had to get it out of the garage. 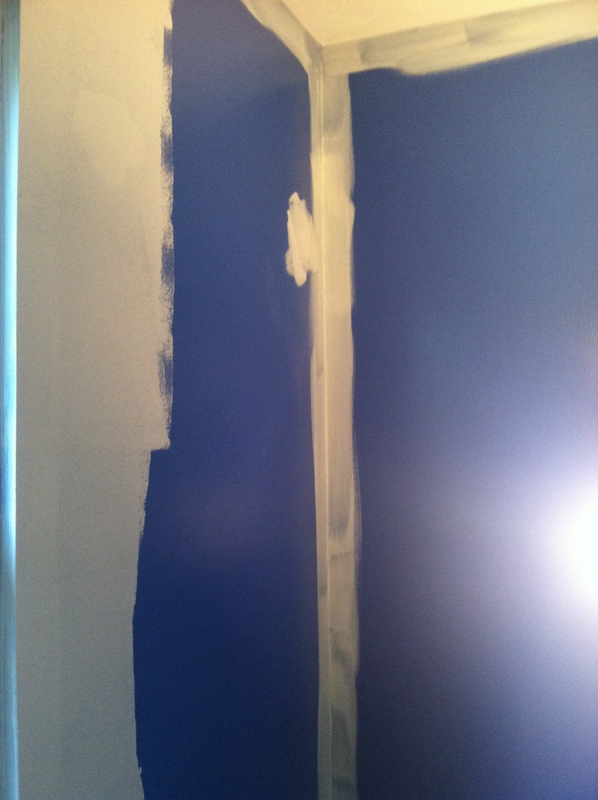 First I sanded like crazy because there was a ton of sheen to break down on this thing. Then I whipped out a recent impulse purchase: liquid deglosser. I had heard great things and given the hard to sand rounded edges I had to deal with I figured it was worth a try, especially at $7 a bottle. A $7 mistake is okay with me. And if it was a bust I had only tried it on a free table with no real hope to begin with. 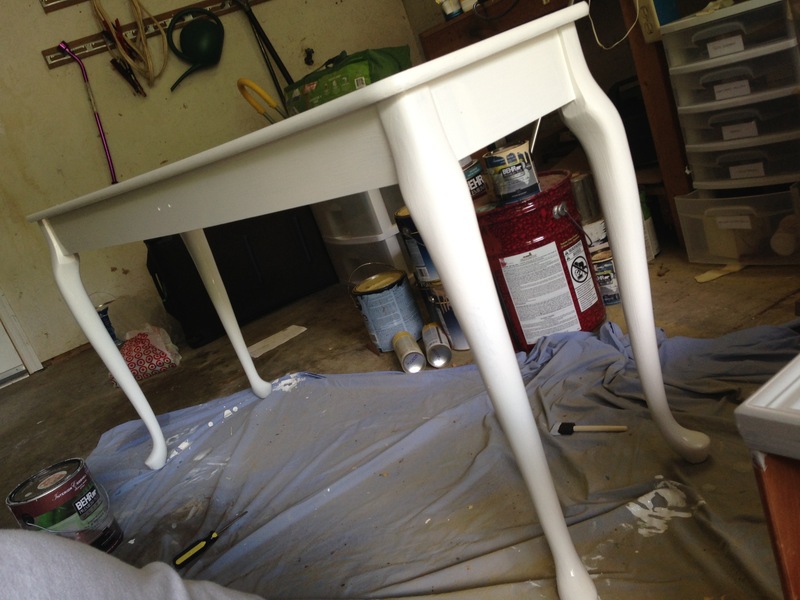 Sand, degloss, two coats primer, two coats of paint. In the end I was left with a more “yard sale chic” version of the starting point. I painted the hardware to the faux drawer (easier than flawlessly filling the holes) with bronze spray paint. The end result was a pleasant surprise. 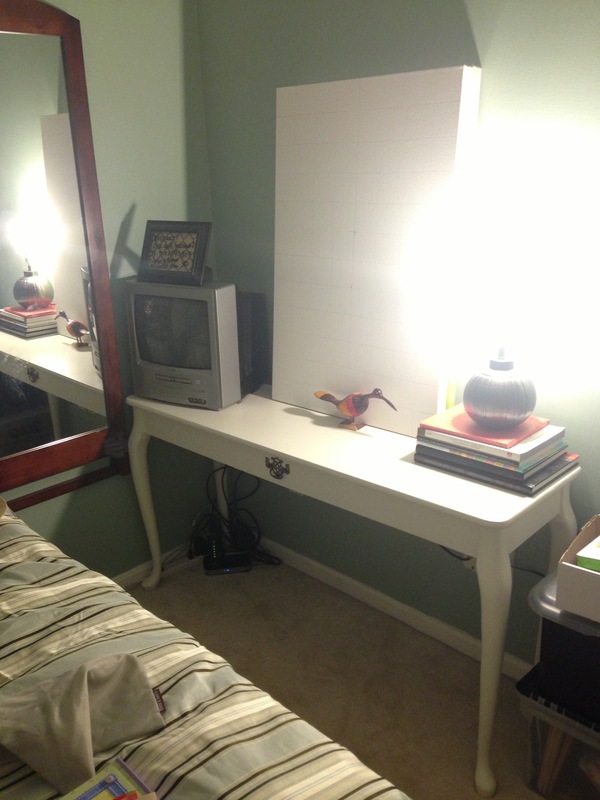 Here it is as the desk/tv stand/vanity in the guest room. See what I mean when I say the guest room is snug? I plan on wrangling the cable/internet wires, finding a stool or ottoman to tuck underneath. 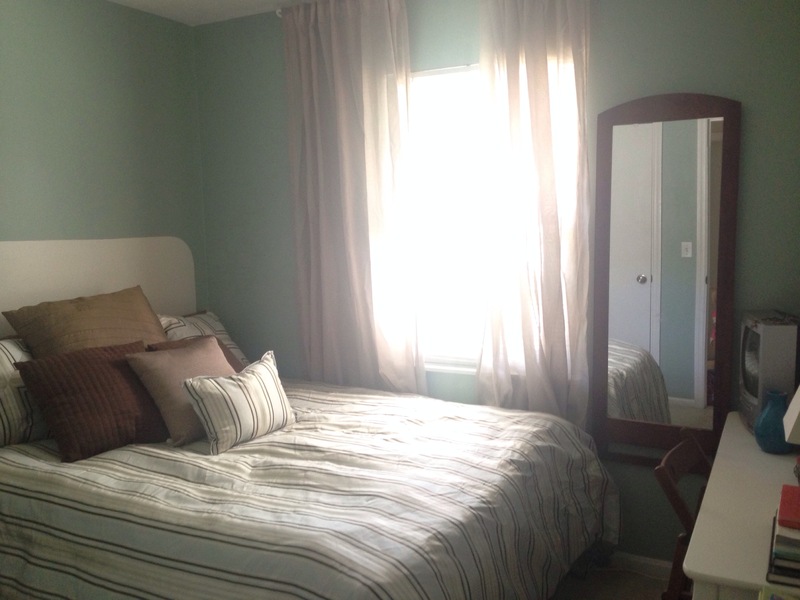 Lookout for an actual post on the guest room. It really deserves it.